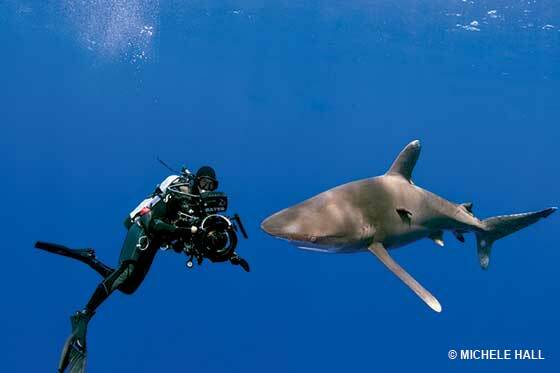 Howard Hall shoots 4K video of oceanic whitetip sharks off Cat Island, Bahamas. Digital single-lens reflex cameras (DSLRs) offer excellent video quality for the price and are a useful one-camera travel solution. But divers interested in shooting video should be aware of some compromises and challenges to motion-image capture that exist with DSLRs. For more than a decade, digital imaging devices — both photo and video — have included crossover features. Each format provides limited capability to capture the other. In 1998 the Sony TRV900 mini-DV camcorder was among the first crossover cameras, allowing digital still-image capture to a floppy disk accessory. More recently the Sony PJ760 camcorder captures not only remarkable high-definition (HD) video images to flash media but also 24-megapixel still images — and at the same time. Many of today's digital still cameras boast built-in video capabilities with impressive frame rates and HD resolution. The introduction of the Canon EOS 5D Mark II (5DMII) camera in 2008 brought into sharp focus the continuing confluence of still- and motion-imaging technology. DSLR video is now making big waves. 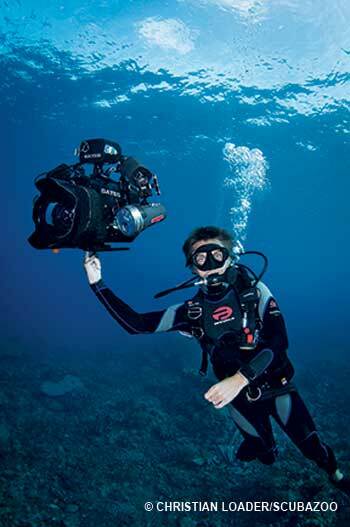 Let's examine the reasons for its popularity and the factors you should consider when deciding whether a DSLR system is the right gear for your underwater video goals. of stable, professional underwater motion imaging. Hollywood was quick to pick up on a significant benefit of the 5DMII: a filmlike, shallow-depth-of-field "look" at a fraction of the cost of other digital-cinema options. At less than $10,000 (outfitted with various video accoutrements), the 5DMII is a far cry from the $30,000+ EPIC, Canon C500 or Sony F55 offerings. The DSLR platform is supported by a vast array of lenses for any production situation. This means the cost of optics with DSLR cameras is dramatically lower; traditional cinema lenses can cost $5,000 to $25,000 per lens. The ready availability of such cinema-grade technology was a boon for aspiring independent filmmakers, and it launched a plethora of award-winning feature films created on shoestring budgets. Like Crazy, for example, was shot for $250,000 and then purchased by Paramount for $4 million after winning the Sundance Film Festival Grand Jury Award in 2011. Television productions accepted DSLRs as well. The final episode of House was shot entirely on 5DMII cameras, pioneering their use for broadcast work. Adding to the appeal of DSLRs are their low-light capabilities, adeptly demonstrated by Vincent Laforet in Nocturne. Remarkably, Nocturne was shot at night and entirely with available lighting. 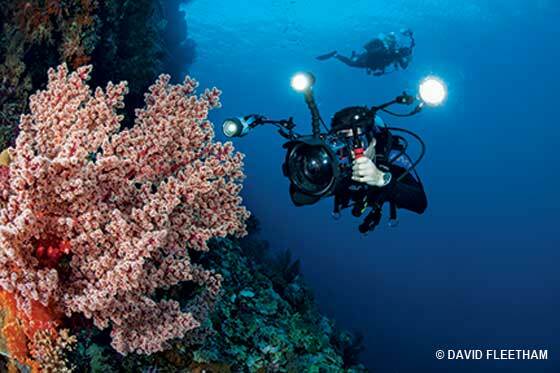 It didn't take long for divers to adopt DSLRs for a wide range of applications, including commercial and broadcast productions, natural history and personal underwater video for social media. My colleague and friend Peter Kragh, a cinematographer, was recently on a Discovery Channel shoot in the Bahamas acquiring video solely with housed Canon EOS 7D cameras. This represents a rapid and remarkable transition from traditional video cameras. "OK," one might ask, "how does it look?" With the proper combination of optics, camera and shooter: simply superb. Backscatter's Berkley White dubbed the 5DMII "a Swiss Army knife for underwater image makers," and White's Bahamas Dolphins is a sharp, detailed example of how to make DSLR motion pictures shine. For DSLR video of the macro realm, see Rolling in the Deep, a five-minute compilation of Dustin Adamson's work with a Canon 5DMKII, an Ikelite housing and Light and Motion Sola lights. This is a relatively inexpensive rig that renders high-quality results. Rolling in the Deep - 5 minute Version from Dustin Adamson on Vimeo. Disclosure: I make housings for video cameras (Gates housings). It is my intention to report here objectively, detailing pros and cons of each system. But the conclusions I draw are opinions — based on my own observations and the experience of other underwater imaging professionals. Low light — Light is always at a premium underwater. The latest round of DSLRs have practical ISOs up to 6400 (higher ISOs have objectionable noise) and afford a greater range of shooting conditions with respect to ambient light. Underwater photographer Eric Cheng pioneered shooting at the extreme of low light, capturing flashlight fish at night as they streamed from their daytime den. Previously it was not possible to record this remarkable behavior without camera equipment that cost six figures. A more conventional example is filming large animals such as humpback whales or mantas, whose immense size and mobility precludes the use of underwater lights. The low-light capability of DSLRs not only makes proper exposures possible but also allows higher f-stops and better depth of field. Travel — If you're looking for a single professional and travel-friendly underwater system, a DSLR is hard to beat. The latest full-featured models from Canon and Nikon produce splendid still photos and HD video. In our world of challenging, weight-restricted travel, this is an important consideration. Depth of field (DOF) — DSLRs have large sensors: either full-frame 35mm sensors (measuring 36mm x 24mm) or cropped sensors (measuring approximately 23mm x 15mm). Optically, the larger a sensor, the shallower its DOF at a given aperture. Hollywood embraced DSLRs and their film-style look because it was a natural evolution from Panavision cameras, which also have 35mm sensors. A shallow DOF can be helpful for certain shots underwater, but it generally makes things more difficult. In Hollywood a "focus puller" has the sole task of establishing and tracking focus on a moving subject. This job exists because critical focus (the small, tack-sharp window of focus) is often so challenging it requires the attention of a single individual. 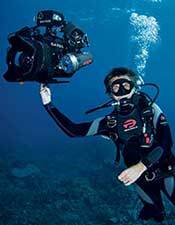 DSLRs do not employ autofocus tracking, so as in Hollywood it is left to the diver to find and maintain critical focus. Practically this is difficult, especially because motion imaging seeks out both action and behavior. There are exceptions, of course, such as shooting a fisheye lens in clear water on a sunny day. That world, at f/16, is largely in focus because of forgiving DOF. That is rarely the case underwater though. There are indeed shots where a shallow DOF can pull a subject out of the background and draw your eye in. But these are more the exception than the rule. As noted previously, most shooters want a humpback whale that's sharp from head to tail. Macro imaging is particularly challenging. The optical physics of small means, quite literally, a paper-thin DOF. High ISOs and enormous amounts of light are necessary to obtain a reasonable DOF. By contrast, sensors found in video cameras are generally much smaller — just 6.4mm x 4.8mm, for example, in the Sony PMW-EX1R, a workhorse HD system in broadcast TV. The smaller sensor translates to a substantially larger DOF and straightforward critical focus. With a large DOF, tracking focus may be unnecessary if the subject remains within what Ansel Adams called the "circle of confusion." Ergonomics — DSLRs were designed for one thing: still photographs. This means the ergonomics of handling them are not necessarily designed or optimized for video. An often overlooked aspect of cameras is the user's interaction with them — how they're held, access to buttons (such as white balance or auto/manual iris) and how framing is done (via eyepiece or LCD). Autofocus — Camcorders have remarkable autofocus capabilities that DSLRs in video mode do not. Camcorders' ability to establish and track focus without "seeking" makes manual focusing virtually obsolete. Autoexposure — Most current-generation DSLRs do not have the capability to automatically adjust exposure midshot. With changing lighting, a camcorder will adjust smoothly and rapidly from one condition to the next. This can be very important in fast-action sequences such as sailfish feeding or mantas at a cleaning station. Housing features — Like cameras, housings have different features designed for their primary task. A smooth, stable shot is a hallmark of professional underwater video. In midwater shots, a neutrally buoyant and trimmed rig helps achieve stability. Professional rigs allow for dynamic buoyancy and trim adjustment. They can operate nose up or nose down, slightly positive or negative or otherwise adjusted for any given shot. Seasoned professionals cite this feature as a critically important element of an underwater motion-imaging system. To my knowledge, no DSLR housing considers this aspect, while every video rig does. Optics and ports — This is easily the most important difference and consideration. DSLRs have optical flexibility in the wide selection of available lenses. Before diving, you choose a lens for wide, medium or macro imaging. Your port may be flat or a simple dome, depending on the optical interaction with the lens. Video camcorders are different. With their built-in lenses, they cover most imaging scenarios, from macro to wide. Thus, you can often obtain a single port to accommodate all needs — and one that is ideally matched to the camcorder's optics. It is important to note here that cinema-grade systems, including certain Canon cameras and those made by RED, share the same optical limitations as DSLRs. Like DSLRs, these cameras employ a wide variety of lenses that include DSLR options as well as cinema-grade positive-lock (PL) lenses that may cost up to $40,000. But there is a meaningful difference: These systems capture 4K resolution (4,000 vertical lines), an attribute necessary in digital-cinema acquisition. To achieve such resolution, sensors are large and depths of field correspondingly small. Although the purpose of this article is to review video capability, the quality of single frame grabs from these high-end 4K (and better) digital-cinema cameras can't be ignored. In the Fall 2010 issue of Alert Diver Howard Hall wrote insightfully about the convergence of video and stills, and a frame grab of one of his RED images of sailfish graced the cover. And these worlds continue to converge; the Canon EOS-1D C offers 4K cinema plus high-end digital stills in a DSLR form factor. For travel, a DSLR system that can capture both photo and video is compelling. All this should lead you to a conclusion: Use the right tool for the job. Underwater DSLR rigs are very different from video rigs. Each has purposes and features that contribute to the success of the photographer or videographer, respectively. For the photographer who wants to grab opportunistic video of subjects best conveyed with motion, a DSLR housing can work brilliantly. However, for a dedicated videographer the advantages of a housed video camera are irrefutable. The DSLR shooter can capture compelling video, and the videographer with a RED EPIC system or similar can produce professional-quality still images from video frame grabs. These are exciting times to be making digital images, and advances in both stills and video will no doubt blur the boundaries ever more in the future. Check out even more samples of videos captured with DSLRs. Stingray Ballet from Stephen Frink on YouTube.